It's refreshing to see a superhero movie done in a style that's no live action nowadays. Looking at Spider-Verse just makes me wish that there are more of such animated movies around that aren't afraid to try a different visual style. 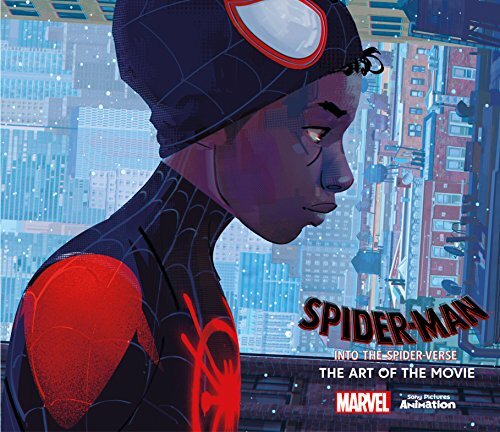 Spider-Man: Into the Spider-Verse -The Art of the Movie is the companion artbook for this wonderful film that won the 2019 Oscar for Best Animated Film, deservingly so. This is a huge 192-page hardcover published by Titan Books that went out of stock pretty quickly and is now, at the time of this review, in the midst of restocking and reprint. The book and film are that popular and that good. Artbooks for superhero movies are starting to look and feel generic to me. So it's really a pleasure to see such a different visual style used here for Spider-Verse. This book is filled with beautiful sketches, stylised illustrations, storyboards, colourful environment and scenes, and different takes of the superheroes and villains we are so familiar with. There's a lot of character designs. You get to see Mile Morales, his mom and dad, Doc Ock, Spider-Gwen, Spider-Ham, SP//dr, Spider-Man Noir, , Prowler, Scorpion, Kingpin and more. The artworks in this book are just terrific, beautiful and varied. It's just a refreshing break from concept art created for live action movies. This is definitely one of 2018's best artbooks. Highly recommended. If you can't find it on Amazon, try Book Depository. Links below.